Although California’s Proposition 2 doesn’t go into effect until 2015, the law that will give the state’s egg-laying hens, breeding pigs, and calves raised for veal room to turn around has already helped animals in many ways. Not only did the ballot initiative pass by a landslide in November 2008, but in the months leading up to the vote, Prop 2 advocates educated countless people about the horrors of factory farming. Also born from the campaign was Santa Clara County Activists for Animals (SCCAA), a grassroots organization dedicated to reducing and eliminating the suffering of animals and to raising community awareness of animal issues. The group works to prevent cruelty to all animals, especially those used for food, clothing, and entertainment. I mention SCCAA not only as an example of how one campaign can grow roots and blossom into other outreach efforts, but how one of those efforts recently achieved victory for animals. 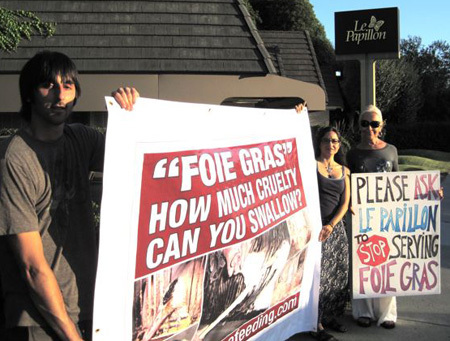 Among the campaigns SCCAA has worked tirelessly on is the effort to end sales of foie gras in their area. Foie gras (French for “fatty liver”) is created by force-feeding ducks until their livers become diseased and enlarged. The ducks’ livers may grow to 10 times their normal size, causing them tremendous suffering. The ducks are also deprived of access to swimming water, which they need to stay clean and healthy. More than a dozen countries have outlawed foie gras production, and in 2004, animal advocates sponsored a California bill that will ban the production and sale of the extravagance in 2012. But SCCAA members weren’t content to wait around: they were determined to eliminate this egregious cruelty from their county. At last, realizing the activists were not going away and were within their rights to demonstrate, Le Papillon relented and informed SCCAA they would no longer be selling foie gras.